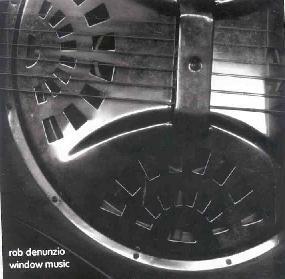 Rob Denunzio - "Window Music"
Opening with the sound of traffic and airplanes overhead I had the impression that Window Music would be a sound collage album made up of field recordings. No sir. This is probably the most traditional styled album I've heard from the Public Eyesore label yet. Denunzio plays folk and Blues on the acoustic guitar and when he lays on the slide the sound is close to the Fahey/Kottke realm. But though Denunzio is an expressive player and there's lots of pleasant and enjoyable music here, it is often slow moving, lacks fluidity, and seems to be searching for some direction. But there are tracks which indicate that Denunzio is a decent player, and can do so with passion. "No Clue/No Roots" is a standout track with a traditional finger picking Blues style that I thoroughly enjoyed. Ditto for "Falling Down Blues". "Fog & Raccoons" is another track I enjoyed that features some very nice soloing and for 8 minutes Denunzio segues through a variety of well connected themes. This would be a strong set if all the tracks on the album were as inspired as these. Sometimes I find myself questioning Denunzio's proficiency with his instrument and whether or not he's really awake while playing, and then he turns around and wows me. An inconsistent album but the strong moments are very good.